This photo is the original architecture of Saint basil’s cathedral. It is a church located in Red Square in Moscow, Russia. It was built from 1555–61 on orders from Ivan the Terrible. 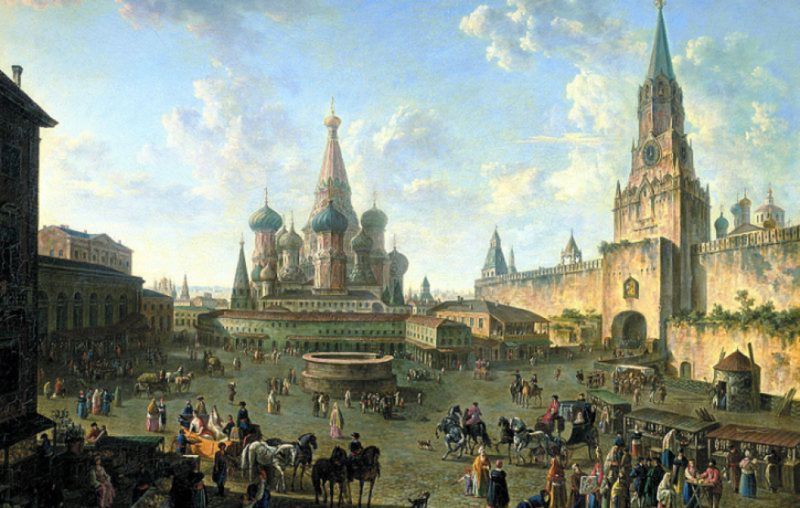 It was the city’s tallest building until the completion of the Ivan the Great Bell Tower in 1600. History: St. Basil’s was built to commemorate the capture of the Tatar stronghold of Kazan in 1552, which occurred on the Feast of the Intercession of the Virgin. “The cathedral was thus officially named Cathedral of the Intercession of the Virgin by the Moat (the moat being one that originally ran beside the Kremlin).” It was built over Vasily’s remains. Architecture: The building consists of nine chapels build on a single foundation. The building is a symmetrical design. There are eight domed chapels symbolizing the eight assaults on Kazan. The ninth was built later on in the year 1588. In the center is a tent-roofed spire topped with a small golden dome. There is no other building that looks similar to it around the world. The wide variety of colors and shapes make it unique. Another interesting fact about St. Basil’s is that no matter what vantage point you are at, you can never see all of the onion domes at the same time! It is really breathtaking up close, and of course I got my cliche touristy photo in front of it. Why did you choose to discuss St. Basil’s cathedral for this post? That is, how do you think the building is significant to Russian history? For example, you might be interested in looking at the role of religion in Russian society during the era of the Russian empire vs the era of the USSR. Or, you might be interested in why St. Basil’s has become such an icon for the country. You could add to this post by touching briefly on how St. Basil’s ties in to Russian history in the late 19th century. Very interesting! I did not know that this iconic structure was commissioned to signify the Russian conquest of Kazan. It’s amazing that it took eight sieges to conquer Kazan as well, and this is why there are eight domes. I’ve always wondered what that building was! I see it all the time in pictures of Moscow. That’s pretty neat that it’s a cathedral and not some palace. I don’t know much about Ivan the Terrible but I’m curious as to why someone nicknamed ‘terrible’ would build a church. Hey there! The meaning of Ivan’s moniker gets muddled when translating from Russian to English. The “terrible” in Ivan the Terrible is closer to “fear-inspiring” or “powerful”. It isn’t so much like the pejorative common English usage. I know that ‘onion-domes’ are a very popular staple of Russian architecture, but did not realize that they individually carried symbolic significance until you mentioned that the eight domed chapels represent the eight assaults on Kazan. You also mention that a ninth domed chapel was later built with a tent-roofed spire and golden dome. I wonder if that ninth dome represents something and why it warrants additional unique features? Furthermore, I wonder what onion domes cost to build upon construction of Saint Basil’s Cathedral.